Shimla : As many as 10 people have been killed while many others are feared to be trapped after boulders fell on Gurudwara Manikaran Sahib near Kullu due to alandslide in Himachal Pradesh. Rescue operation has started. The death toll is feared to rise. Local residents are helping government in the primary rescue operation. Gurdwara Shri Guru Nanak Dev Ji, also called as 'Gurdwara Manikaran Sahib' is situated in Manikaran, in Kullu District. Kullu Deputy Commissioner Rakesh Kanwar confirmed that eight bodies which were buried under huge boulders have been extricated while search is on for more. Eyewitnesses claimed that the dead could be more than ten in number as a large number of people had taken shelter in the building, close to the Gurdwara, when the tragedy struck. The exact number of dead or injured could not be ascertained as some bodies are feared to be buried under the debris. 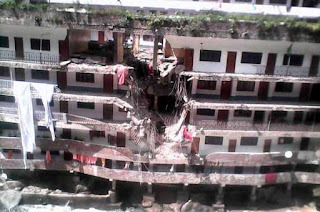 The district administration has sought the assistance of Gurdwara authorities in locating and identifying the bodies as most people staying in the building were outsiders. People ran helter-skelter as boulders fell on the building and many were trapped as a huge portion of the three- storey building virtually collapsed. The locals and Gurdwara management immediately swung into action and started rescue operations while Additional District Magistrate, Sub Divisional Magistrate, Kullu and other district officials rushed to the spot. Those injured have been admitted to zonal hospital at Kullu and condition of seven of them is stated to be serious.